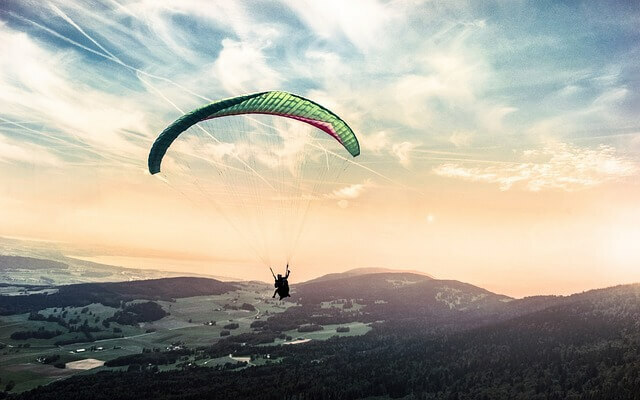 5 Best Paragliding Places in India! If you are from Southern states of India then this place is a gem for you. The hill station is situated in Kerala which offers you an opportunity to take off and experience the same which the birds experience. Paragliding takes you closest to the nature to fly without wings. For paragliding in Vagamon, rides are available from 11 am to 4:30 pm. You can feel the crisp mountain and gentle air over a beautiful tour and enjoy it. It provides you to get a bird’s eye view of Vagamon. In the Vagamon you can experience nature as sparkling rivulets, waterfalls and dense pine forests. One of the most famous places in India for nightlife and many different things. Out of those many things Paragliding happens to be one of them. Goa houses a number of beautiful beaches in India which makes the place outshine, out of these beautiful beaches Arambol beach is one among them and is also one of the best places for paragliding. Arambol beach is present around 50KM from Panaji which happens to be the capital of Goa. If you need to do paragliding then it will be available between September and May which is the most favorable conditions in Goa although if you are a real enthusiast then you must try Gliding at the place around the month of January. You can climb on top of the hill, harness yourself with proper equipment, safety and can take help of the experts, jump off the cliff and sail through the winds which are been offered by Goa’s nature. One of the best places if you are looking to experience the cold weather while gliding. With Paragliding, you can easily experience one of the prettiest hill station in India from the bird’s eye view. If you are looking to paraglide in Mali then Solang Valley is one of the best places to Glide. The timings allowed for paragliding are 9 am to 5 pm. The costing differs according to the criteria and you will have to look after it once you reach there. The costing ranges from INR 600 for a short fly to 3000 INR for a long flight. The place is the best if you want to experience heaven on earth. Don’t want to go too far places to experience the world from a height and if you are from Mumbai then at the Mumbai-Pune highway you can experience the same near Pavana Dam. Here you can fly as high as 300 meters from the ground and can explore the beautiful water bodies and green lands. You fly through the sky at a height of around 300 meters above ground level. While flying you will get to experience the water bodies and green lands around Pavana. The experience is totally different you feel as if you are flying like a kite. Here you do get the experts from the field from whom you can easily get trained and enjoy the session to the fullest. By the name, it is quite clear that the place is located in Yelagiri hills which are the best paragliding site available in South India. Here you high well above 2000 meters above the ground level. Here in you can easily explore the hills as the bird would do at a height. The best time to visit Yelagiri is either in the mid-year or after the rainy season which ends in the month of September. PrevHow Much Exercises Should You Do to Lose Weight? Next3 Bathroom Trends You Might Want to Consider!